Wichita Community Theatre Presents Agatha Christie's "And Then There Were None"
Home > News > Entertainment > Wichita Community Theatre Presents Agatha Christie's "And Then There Were None"
Wichita Community Theatre continues its 2018-2019 Season with the whodunit "And Then There Were None" by Agatha Christie October 17-28. Will anyone make it out alive? Who is behind the diabolical scheme? Clues and red herrings abound in this masterpiece from Agatha Christie. Performances are 8 p.m. Wednesdays through Saturdays with 2 p.m. Sunday matinees on 10/21 and 10/28. Tickets are $15 or $13 for military/seniors/students. There is a special opening night ticket price of $11 for all on October 17 only. Call for reservations 316-686-1282. 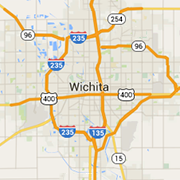 Wichita Community Theatre is located at 258 N. Fountain.